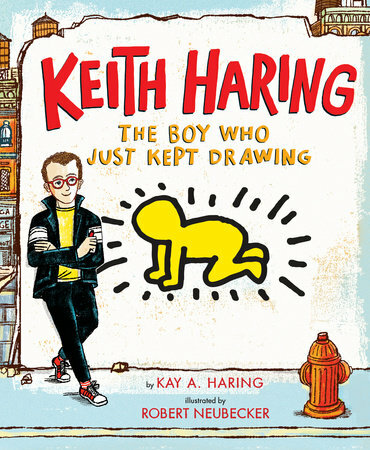 Keith Haring: the Boy Who Just Kept Drawing by Kay Haring is a bright and buoyant introduction to the artist. Kids meet Keith as a child and they learn about his perseverance through the repeated messages, “he never stopped drawing”, “and just kept drawing”. It’s a great way for kids to see a first-hand experience of how persistence and hard work pays off over time. Haring began creating his art on the street. He wanted it to be accessible to everyone. It is clear that even though he began to make money for his art that was never his drive. His drawings consist of complicated things (people, babies, dogs) drawn as simple shapes, in bold colors with expressive action lines around them. Many people don’t understand how Haring’s art made it off the street and into galleries, and onto fashion runways. The author, Haring’s younger sister, addresses these issues directly asking, why questions on every page. “Why didn’t you take the money?” “Why are you drawing pictures that look like scrambled bodies?” The text covers an impressive arc of the artist’s life as well as encouraging readers to think about different aspects of art and its value to society. The illustrations have a Haring look without being imitative. They are an infusion of photos of some his actual pieces spliced into new original drawings by Robert Neubecker. The end pages have fabulous, busy Haring doodles. The book shies away from the artist’s personal life and struggles with AIDS and drugs and does not mention his death in the text. Although there are brief mentions of these topics in the four-page author’s note at the end of the book. This section also features photos of the artist. Next Houston: Its Not Me, Its you – Anti-Valentines Art Show This Friday!